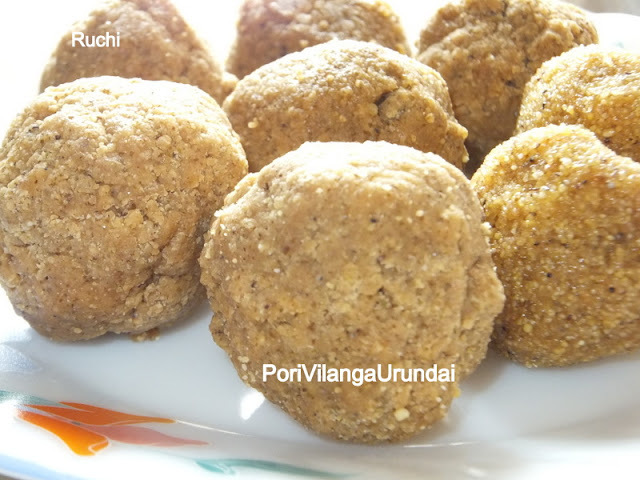 Porivilanga is a famous "pandam" ( Pandam means dish)in our Tirunelveli dist. porulvilanga urundai is a traditional recipe and it is a nutritious pack of, protein rich peanuts, roasted gram, mung dal, dry ginger which aids in digestion. The name of the sweet ball means that the consumer may not know what it consists of. Which translates as, "porul - meaning, vilanga - cannot understand, urundai - balls", which denotes that, one cannot make out the ingredients that has gone into the making of this laddu. But now the word is modified to "Porivilanga" in due course time. In this sweet Actually we can add more the ingredients as per our taste. 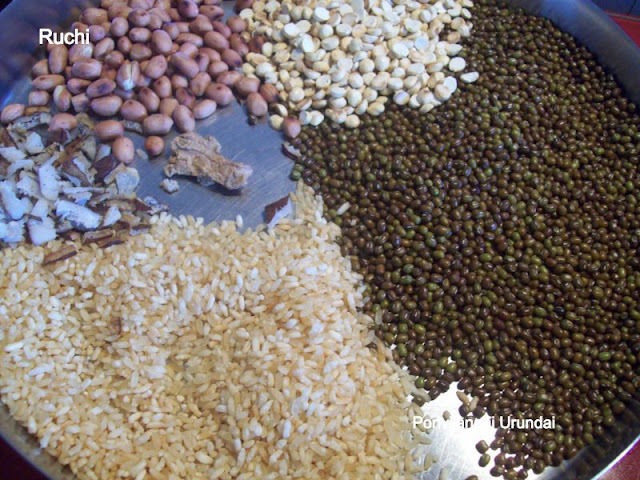 ( Wheat, channadal, barley, sago, almond, cashew nut ,etc. ), This Laddu Its taste will be yummy but it becomes harder to bite after an hour of preparation. poriviLangai urundai used to be the jawbreaker .Usually it is very hard and needs to be broken using even a hammer sometimes! Good notes about this dish not require any fats in the form of ghee /r butter, nor does it contain refined sugar! 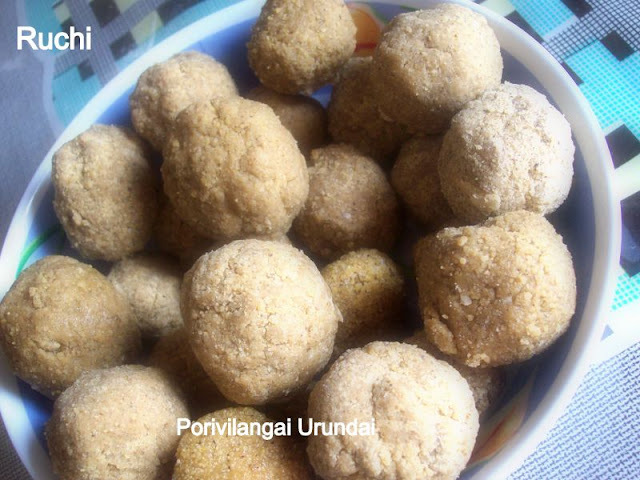 I remember those wonderful days when my grand mom used to prepare porulvilangai urundais for all of us.She & my mother used to make large size balls by pressing the mixture in both hands, but what I have done is relativelyasmallersize. 1. Roast the grains and dals separately, in a kadai,till good smell comes and raw taste gone or to brown colour. 2. Mix the roasted and cooled grains and dals together along with sukku /drygingerand pound it to a fine powder. . If it is not fine, sieve it into fine powder again and add and cardamom powder. 4. Then add the powders and Pour little by little syrup on a portion of flour. mix well and and lift out in hand and make balls while it is still hot. 5. Keep them on a plate to cool and store in airtight jars. Enjoy this Traditional Nutritious dish! Woww.. Very traditional and healthy recipe.. looks absolutely amazing.. gr8 job dear !! Mouth watering recipe..New to me..love traditional homemade snacks. Make me nostalgic, my grandma's signature sweets. delicious and inviting dear !!! Join me in Fast food event - Noodles .